Are Cockroaches Afraid of Light or Attracted to Light? Most roaches are very afraid of light. You might be familiar with the saying that someone scattered or ran “like a cockroach when the light turned on.” But why is this? Are cockroaches really afraid of the light? The roaches brain is programmed to fear, or more accurately, have an aversion to light. Through evolution, cockroaches have developed this trait as a survival mechanism because it has been proven over thousands or millions of years doing so leads to a higher likelihood that a cockroach will live long enough to complete its full life cycle. Staying in the dark helps a roach go about its business without being detected, which is an enormous advantage for survival. Cockroaches have many predators– from birds to cats to rats and many more. So roaches know instinctually that they must stay in the darkness to have the greatest chance to not become someone’s meal. Being seen in broad daylight makes them easy pickings for predators. This is why cockroaches scatter when the light is turned on. It is also why roaches are nocturnal, meaning most of their activity is undertaken during the daytime. Roaches are dormant for most of the day and are only active for about four hours of every night. This is usually long enough for them to find enough food and water to last them for a full day. Roaches will not venture out into light unless they are desperate for food or water and don’t have any other choice. If you see a roach during the daytime, it is going against its own instincts. This is also a good sign that you have a roach infestation. Once it has secured necessary food and water, a roach will return to its dark hiding place. 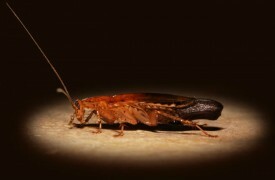 Cockroaches have developed unique sensory abilities to facilitate their living in darkness. Roaches not only use the dark for cover, but also the their antennas sense tiny vibrations and air movements so that they can detect any other animals nearby which may be a threat. In addition, roaches eyes have a sort of night vision which allows them to see in very dim, dark places. They also have antenna which allow them to smell and taste, as well as sense movement and vibrations in the air. Are some cockroaches attracted to light? As mentioned, almost all species of roach are afraid of light. But not all. The only cockroaches that are attracted to light are the Oriental cockroaches. These roaches are attracted to street lights, televisions, and other electronic devices. You might see them gathering near various artificial light sources in the middle of the night.